41 lbs. - 75 lbs. Over 75 lbs. 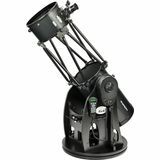 The Orion SkyQuest XX12i telescope is perfect for the observer looking for a portable big-aperture telescope. The tube and base easily disassemble into compact pieces for transport. 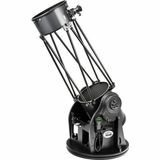 Locate more than 14,000 celestial objects with the push of a button. 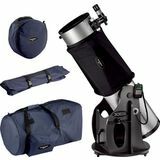 This value-packed bundle includes the 12" XX12i Truss Tube IntelliScope Dobsonian, a specially designed Light Shroud to block stray light and a 3-piece Case Set to protect the optical tube sections during transport and storage. The SkyQuest XX14i allows you to see more detail than the XX12i. 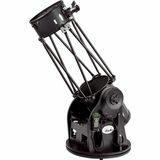 The optical tube and base easily disassemble into compact pieces for easy transport in a standard size car. With the push of a button, you can locate more than 14,000 celestial objects. 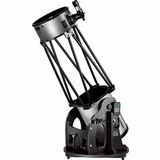 The SkyQuest XX14i reflector allows you to see more detail than the XX12i, and with the push of a button you can locate more than 14,000 celestial objects. 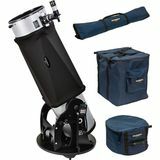 This telescope package also includes the light shroud and tube case set for easy transport. 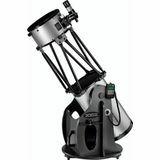 Capable of providing stunningly detailed views of faint deep sky objects as well as the Moon and planets, the Orion SkyQuest XX12g GoTo Truss Tube Dobsonian features a computerized GoTo system, and a 12" tube that breaks down for compact portability.